For larger patio spaces and wherever you want to create a big splash, we have our 20-inch Mordecai garden gnome. He's respectful of all the creatures of the forests, and he'll watch carefully over your suburban yard as well. With hand clasped in prayer and a thoughtful expression, Our Mordecai gnome is very special and will be loved by your entire family. Place him in the center of a fantasy scene that might include small ceramic birds and animals at his feet, or perhaps in front of a garden fence, by a man-made fountain or near a large rock for added atmosphere. He can also be kept indoors as part of a special holiday decoration, or as a permanent "greeter" at the front door. 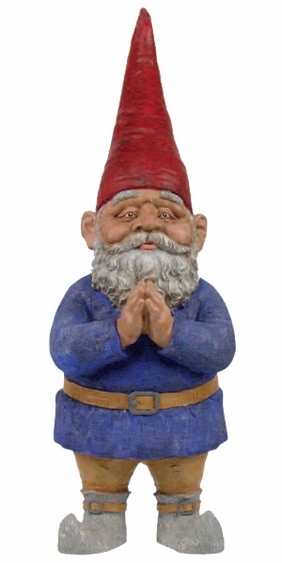 We have Mordecai gnomes in other sizes too, including 13 inches, 15 inches and 32 inches. Our garden gnomes from GardenFun add a touch of the mystical to any decor.